White-nationalist Richard Spencer brought his “alt-right” movement to the University of Florida Thursday, calling America a “white country,” but his message was drowned out. Attempting to speak over the derisive shouts and chants from a diverse and hostile crowd at the Phillips Center for the Performing Arts, Spencer and others attempted to preach about what they called the failure of diversity and the success of identity politics. But the perpetual heckling quashed much of the dialogue, angering Spencer, who mocked the university students throughout his remarks. Outside, hundreds stood in protest on a barricaded street where law enforcement from throughout the state stood watch, on the road, on roofs, in nearby woods, in helicopters and through drones. Gov. Rick Scott had earlier in the week declared a state of emergency for Alachua County in advance of Spencer's appearance. While Scott's emergency declaration helped to increase tension across campus, Thursday's event was relatively calm and resulted in just two arrests, according to the Alachua County Sheriff's office. One man was charged with resisting an officer without violence, according to the sheriff's office. Another man was arrested for carrying a firearm on campus, a violation of state law. According to the sheriff's office, Sean Brijmohan, a 28-year-old from Orlando, was an armed security guard hired by the media. Inside, about 30 white-shirted supporters lined the front two rows, cheering Spencer and other speakers during the 90-minute event. Those in the front rows were separated by several empty rows from the more inflamed audience members that were targeted by the speakers for supporting “anti-white” diversity. 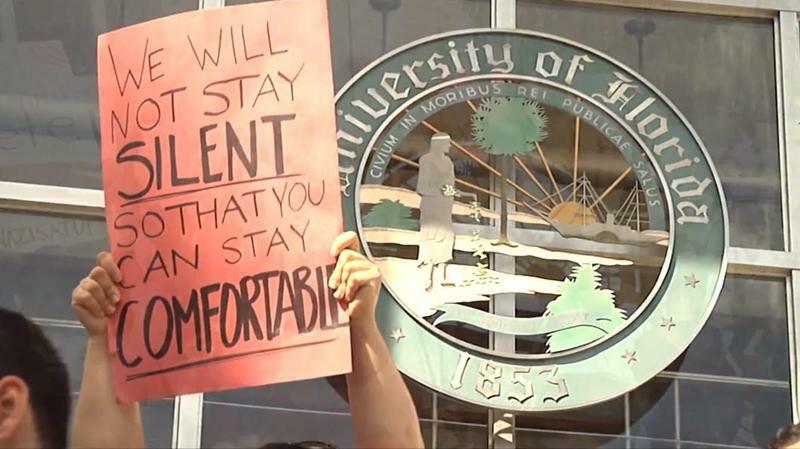 Many students and faculty strongly opposed Spencer's appearance, which UF President Kent Fuchs and others urged the university community to boycott. The school had initially denied Spencer's request to speak. But Fuchs has noted that, while Spencer's appearance isn't sponsored by any student group, the public university couldn't lawfully prohibit the event based on the content or views expressed in the speech. During his speech, Spencer said he was glad Fuchs “stood behind him” and allowed the event to go on. His remarks drew a hasty rebuke from Fuchs. “For the record, I don't stand behind racist Richard Spencer. I stand with those who reject and condemn Spencer's vile and despicable message,” Fuchs tweeted Thursday afternoon. His jibes were delivered over a crowd whose chants included “Nazis are not welcome here,” “go home Spencer,” “black lives matter,” accompanied by raised fists and the middle finger. The crowd also blamed Spencer for a death at a “Unite the Right” rally in Charlottesville in August, when Heather Heyer was killed after a car plowed into a crowd of counter-protestors. Dozens of others were injured. Prior to the speech, Spencer held a press conference that he opened by confronting an NBC reporter about the distribution of tickets. NBC reported earlier in the day that the tickets were only going to supporters, based upon the information they had been given at the time. The network updated the posting to say tickets would go to anyone who wanted one. Spencer later claimed “the alt-right is a revolutionary movement in the best sense of the word. He said non-whites, who favor mass-immigration and multi-culturalism and global America, have other countries in which they can go reside. “It would be a much more peaceful world, it would be a much more meaningful world for all human beings, it would be a better and more beautiful world if people like me were in power,” Spencer said. He and a group of his supporters, who joined him onstage during the press conference, disavowed they were responsible for violence at past events. He said he initially believed his college tour, where “controversial and dangerous” could be discussed, would be easy. “I am bringing ideas that are not being taught in this stifling, PC, academic environment we all live through,” Spencer claimed. The school charged Spencer's National Policy institute more than $10,000 to rent the building, but security costs for the UF event have grown to $600,000. 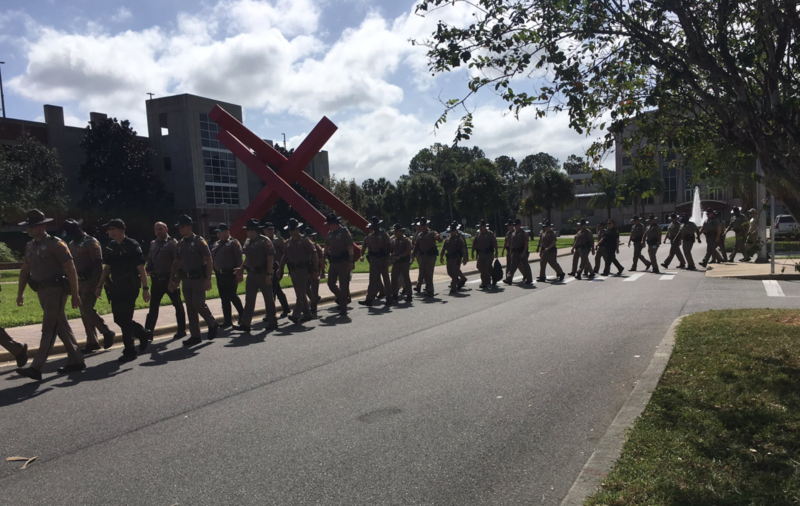 An estimated 500 law enforcement officers, from the around the state were reportedly on campus Thursday. White nationalist Richard Spencer spoke on the University of Florida campus Thursday, met with vocal protest inside and outside the venue. 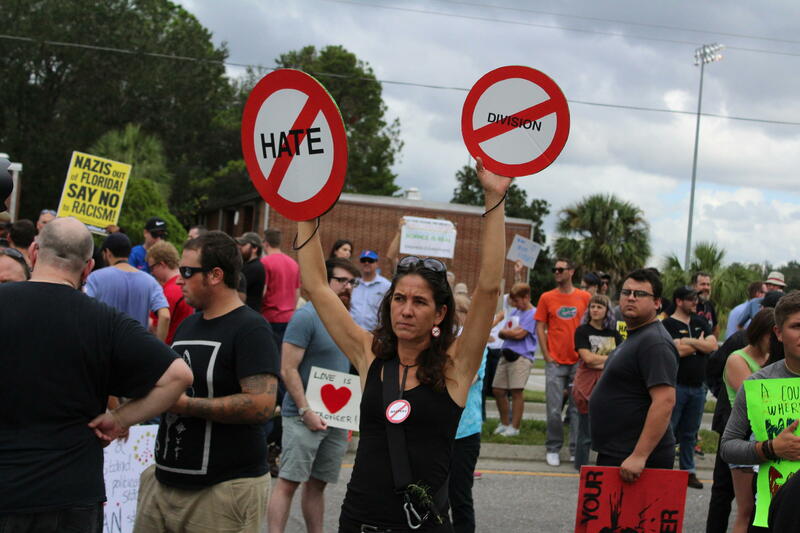 University of Florida students arose Thursday to a campus outwardly expressing messages of love against the backdrop of a heavily armed law enforcement presence and the specter of a divisive mid-afternoon speech by white nationalist Richard Spencer. The Lubavitch Chabad Jewish Student Center had been open since Wednesday for a three-day “Good Deed Marathon,” which drew praise from University President Ken Fuchs. Supporters of Richard Spencer, the firebrand white nationalist whose upcoming appearance at the University of Florida sparked a state of emergency, say he's not a racist. Protesters with the group “No Nazis At UF ” are demanding that university officials change the banned items list for white nationalist Richard Spencer’s event Thursday.